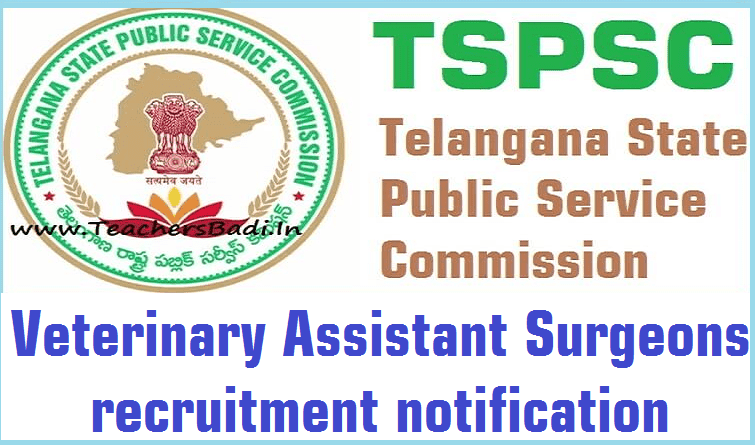 TSPSC VAS /Veterinary Assistant Surgeons Recruitment Selection list Results 2018 :: TSPSC VAS /Veterinary Assistant Surgeons Recruitment Results, Certificates Verification dates 2018: TSPSC Veterinary Assistant Surgeons Recruitment 2017, Answer Key, Results/ TSPSC Veterinary Assistant Surgeons Recruitment 2017, Hall tickets, Bio data Corrections: TSPSC Veterinary Assistant Surgeons Recruitment 2017 Online application form/ TSPSC Veterinary Assistant Surgeons recruitment 2017 : TSPSC Veterinary Assistant Surgeons recruitment 2017, Online application form, Selection procedure, Exam pattern, How to apply, last date for apply, #halltickets, #results, Selection list, certificates verification and more details are given here. TSPSC has published the Veterinary Assistant Surgeons recruitment notification on 01-06-2017 and applications are invited Online from qualified candidates through the proforma Application to be made available on Commission’s WEBSITE (www.tspsc.gov.in) to the post of Veterinary Assistant Surgeon (Class-B) in Animal Husbandry, Dairy Development & Fisheries Department. The Commission published the List of Registered Numbers of provisionally selected candidates tothe postof Veterinary Assistant Surgeons in Animal Husbandry Department (Notification No.32/2017) Dt: 02-06-2017 for 07 (Seven) vacancies. The written test was held on 27/08/2017 and Oral test (interviews) were held on 25/01/2018. The registered numbers of selected candidates are available in the Commissions Official web site (www.tspsc.gov.in). On the basis of the results of the written examination held on 27 TH AUGUST 2017 and verification of certificates held on 18TH JANUARY 2018 &Oral test (interview) held on 25TH JANUARY 2018 at TSPSC Office, Hyderabad to the post of VETERINARY ASSISTANT SURGEON IN CATEGORY (4) CLASS-B IN ANIMAL HUSBANDRY DEPARTMENT . The following registered numbers have been provisionally selected for appointment to the post of VETERINARY ASSISTANT SURGEONIN CATEGORY (4) CLASS-B IN ANIMAL HUSBANDRY DEPARTMENT vide Commission’s Notification No.32/2017subject to the following conditions. 1) That success in the Examination confers no right to appointment unless the appointing authority is satisfied after such enquiry as the case may be considered necessary that the candidate, having regard to her/his character and antecedents are suitable in all respects for appointment to the service. If it comes to the notice of the Commission later that any candidate furnished false information or the selection is not in order due to any act of Omission or Commission of any candidate then her / his provisional selection is liable to the cancelled at any stage and they will forfeit all consequential benefits including that of selection, besides the Commission reserves the right to take any action as it deems fit in the circumstances of the case and subject to outcome of the court orders if any, in terms of the provisions as notified in NotificationNo.32/2017. TSPSC has conducted Written Examination for the Notification No 32/2017 notifications from 27/08/2017 to 28/08/2017 FN & AN. The Results, Certificates Verification dates 2018 of VAS /Veterinary Assistant Surgeons Recruitment exams will be available on TSPSC website from 10/01/2018. For more details please visit the TSPSC Official website. You can find The Results, Certificates Verification dates in the Whats New section of TSPSC Web Portal. The list of Registered numbers of provisionally admitted candidates for verification of certificates for the Veterinary Assistant Surgeon posts are hosted on the commissions website. On the basis of the Written Examination held on 27/08/2017 to the posts of Veterinary Assistant Surgeon in Animal Husbandry Department, the candidates with the following Registered Numbers have been provisionally admitted for the verification of Certificates. The candidates who are provisionally admitted for the verification of Certificates are required to produce the Original Certificates along with one set of Photostat copies duly attested by Gazetted Officer, relating to Age, Qualifications Community (Integrated) , Latest Creamy Layer exemption certificate in case of B.Cs as per Memo No.3009/BCW/OP/2009, Government of Telangana, Backward Classes Welfare (OP) Department, Dt:18/12/2015 (prescribed format hosted on website), Certificates relating to claim of age relaxation, Study (from 4th class to 10th class), basic information data (Check List(1set), attestation forms (2 sets) and if any, at the time of verification of documents, failing which, they will not be admitted in subsequent process of selection. No request will be entertained for subsequent submission of any of the above certificates. In terms of the notification, the candidates should possess the requisite qualifications as on date of notification i.e., 02/06/2017. The verification of certificates will be held in the office of Government Polytechnic College (Sankethika Vidhya Bhavan) Masab Tank, Hyderabad on 18/01/2018 from 9.00 AM onwards. The candidates are requested to obtain and keep ready all the certificates as mentioned in the Notification. WEB NOTE for Edit Option: TSPSC Veterinary Assistant Surgeon Recruitment 2017 Edit Option, Bio Data Corrections, Online application form Corrections for Veterinary Assistant Surgeon in category (4) of class –B in AH department Notification No 32/2017: The candidates who have applied for the post of Veterinary assistant surgeon in category (4) of class –B in AH department are hereby informed that in recent recruitments it is observed that, the candidates are often committing mistakes in filling Bio data in their respective applications and requesting TSPSC for Bio data corrections in their respective PDF applications. But it is not feasible for TSPSC to make corrections in candidate’s respective applications, as it is the candidate’s responsibility to fill the application form correctly. Applicants must possess the qualifications from a recognized University as detailed below or equivalent thereto, as specified in the relevant Service Rules, indented by the department as on the Date of Notification. Must possess a Bachelor’s Degree in Veterinary Sciences and Animal Husbandry or its equivalent qualification from any recognized University/ Institution in India or abroad.